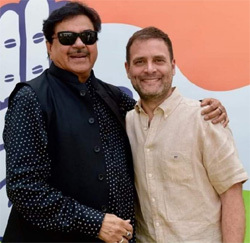 NEW DELHI: Actor-turned-politician Shatrughan Sinha, 72, has finally decided to quit the BJP and is joining the Congress. He had a meeting with Congress president Rahul Gandhi on Thursday. "Painfully....on the way out of BJP....But hopefully in the best direction under the dynamic leadership of my dear friend Lalu Yadav and the desirable, most talked about leader from the Nehru Gandhi family... the true family of nation builders..," he tweeted. "He is younger to me, but today he is a popular leader of the country," he said about Rahul gandhi. "He (Rahul Gandhi) was very encouraging and positive. He praised me saying I had handled attacks and vilification in the BJP with dignity," Shatrughan Sinha, 72, told NDTV after the meeting. "Very positive talks we had," he said about his talks with Rahul Gandhi. He said he has always been an admirer of Nehru-Gandhi family. "I consider them as nation-builders. I have never criticised BJP either." He lamented the autocratic and one-upmanship style of functioning in the BJP. "Father figure, most revered, learned, friend, philosopher, guide, guru & ultimate leader of the Bhartiya Janta Party, Shri. L.K.Advani has been shown the door/royal exit from the electoral politics without his consent & permission (as he was to be part of the decision makers on the seats). It has come as a rude shock & that too at this juncture of his illustrious political career, though it was only expected in this autocratic rule of 1 man show & 2 men army. This action is not only disgraceful, in very poor taste & disappointing for a man of the standing & stature of Shri. L.K.Advani & for other veterans like Shri. Murli Manohar Joshi & Shri.Shanta Kumar also...totally humiliating! "It has hurt the entire nation. People are aghast at this action. Once again I hope, wish & pray that people don't give a proper & befitting reply to this injustice done to our stalwarts & seniors in this elections! May God forgive you! "Painfully....on the way out of BJP....But hopefully in the best direction under the dynamic leadership of my dear friend Lalu Yadav and the desirable, most talked about leader from the Nehru Gandhi family... the true family of nation builders..." Shatrughan tweeted. He has been critical of Prime Minister Narendra Modi and party chief Amit Shah. He even attended an Opposition rally called by TMC chief and Bengal Chief Minister Mamata Banerjee in January last. BJP named Union Minister Ravi Shankar Prasad for his Patna Sahib constituency and he parted ways with the party on that. Now Shatrughan is likely to contest as the alliance candidate from Patna Sahib, which has been his constituency of 10 years. Shatrughan Sinha's main demand is his constituency. "I have said...situation kuchh bhi ho, location wahi rahega (whatever the situation, the location will be the same)." However, the matter remains to be sorted out with RJD.